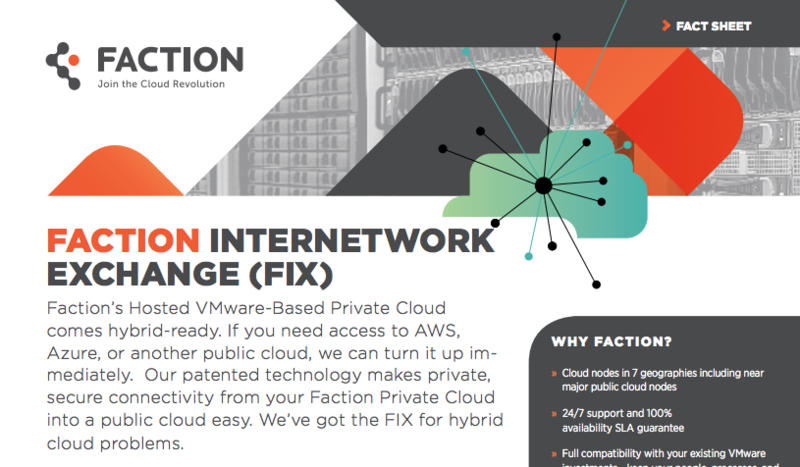 Faction Internetwork Exchange (FIX) | Fact Sheet | Faction Inc.
Faction’s Hosted VMware-Based Private Cloud comes hybrid-ready. If you need access to AWS, Azure, or another public cloud, we can turn it up immediately. Our patented technology makes private, secure connectivity from your Faction Private Cloud into a public cloud easy. We’ve got the FIX for hybrid cloud problems.